This idea of mapping music visualizations as a means of discovery is something that I have previously touched on. In looking at examples of music visualizations that have bore applications, something that I find particularly interesting is that some of the least mainstream genres of music have quite extensive applications built around them. As experimentation with music evolves so does genre classification so it has become increasingly difficult to track and identify genres even within one source of music. This includes, electronic music, metal and jazz. “If the goal of visualization research is to transform data into a perceptually efﬁcient visual format, and if we are to make statements with some generality, we must be able to say something about the types of data that can exist for us to visualize” (Ware). Looking more critically at Ishkur’s application, it’s really quite an impactful collection of data. Although human rendered it includes spatial variables that map correlation between genres, eras and to some degrees artists. The predefined layout of the application doesn’t allow for much user manipulation but offers a variety of ways to interact and explore the offered data. 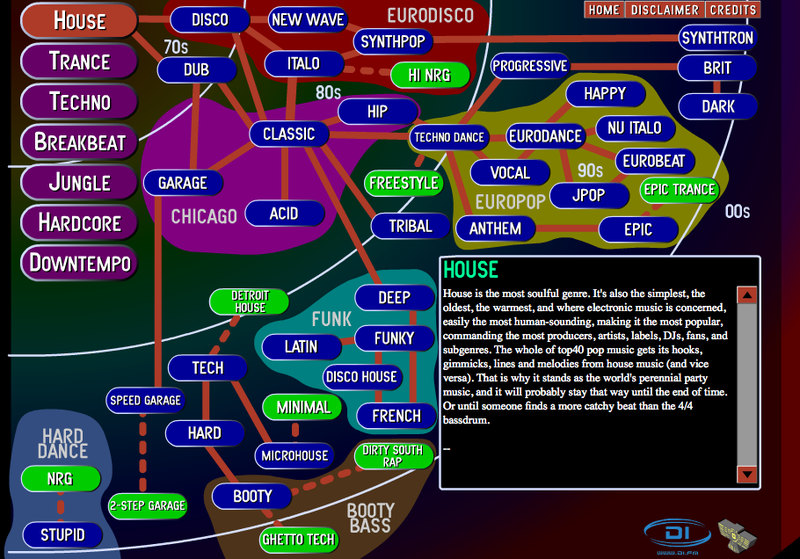 Overall it’s quite a sophisticated yet simple application for exploring the evolution of electronic music. On the other side of the music spectrum, Patrick Gailbraith created the “Map of Metal” visualization to explore sub genres of metal. 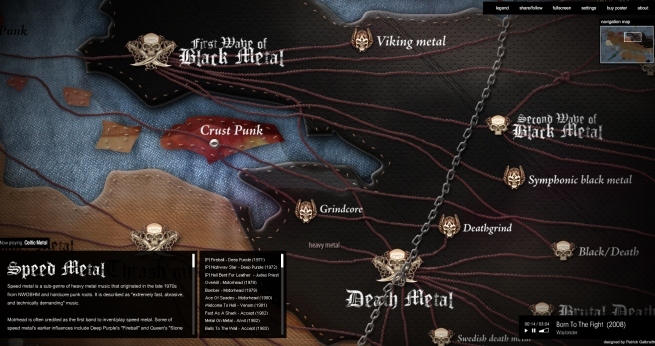 Similar to Ishkur’s Guide, this application uses a map layout to explore relationships and history between metal music. The look and feel of the design is much more clean/modern than Ishkur’s guide but I tend not to favor applications where you have to scroll to discover. I prefer to visualize everything in one screen, have it all in front of me, and then dive in, versus “searching” for elements by scrolling. Jazz is another niche genre of music that has captured its history through interactive visualization. 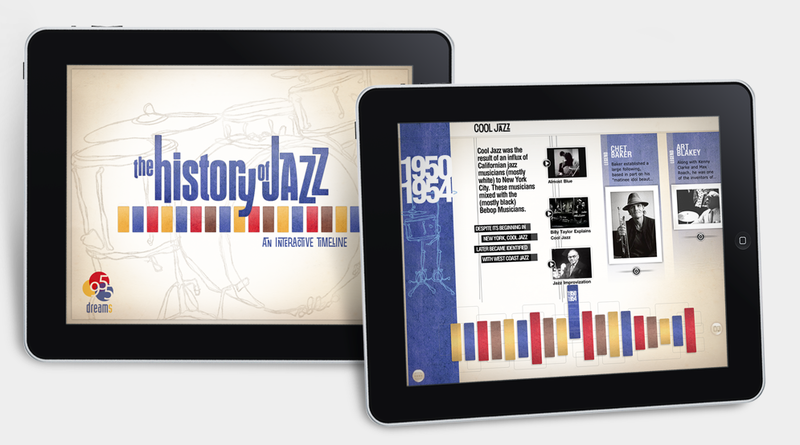 “The History of Jazz” is an iPad application which offers a timeline of the jazz movement. What is interesting about this application is that its developers liken it to the experience of reading a book rather than an online application. In fact it was produced by a publishing company that develops for mobile devices. The look and feel (at least via static images on my laptop) resembles Ishkur’s and the Map of Metal but the medium changes the visualization completely. I suppose for me, Ishkur and Map of Metal feel like an interactive game where as History of Jazz is explored by “flipping” virtual pages. The release of the iPad has added another dimension to visualization and interactivity for exploring music. Taking off my visualization hat, what I find intriguing about these applications is that they belong to such distinct, non-mainstream genres of music. On the surface one doesn’t seemingly attribute research and visualization with metalheads but stereotypes aside, the Map of Metal is an archive. A sophisticated one at that. In fact, I would go so far as to say that its history as presented on the map correlates to its loyal fanbase. By being able to visualize the evolution of electro, metal and jazz it enriches, for me, the listening experience. I don’t identify as a die hard fan for any of these genres of music but those who do are well equipped to share its history. Manovich, Lev. What is Visualization? Oct. 2010. Web. 25 April 2011. Ware, Colin. Information Visualization, Second Edition: Perception for Design (Interactive Technologies). 2004. Web. 25 April 2011. « Scientific Visualization: how to let the brain understand that it sees itself?